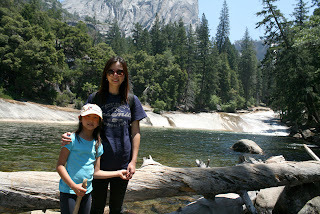 In February, when it was my birthday, I wanted to celebrate it in Yosemite National Park. I thought it will never happen, but one day my mom told me that we were going to Yosemite in June. She said that it will be the third Saturday of June. When the day before that event came, we packed and our clothes and shoes. I was so excited to got to Yosemite and live there for three days! It took us about five hours to arrive at a inn in Fresno that was not that close to Yosemite. 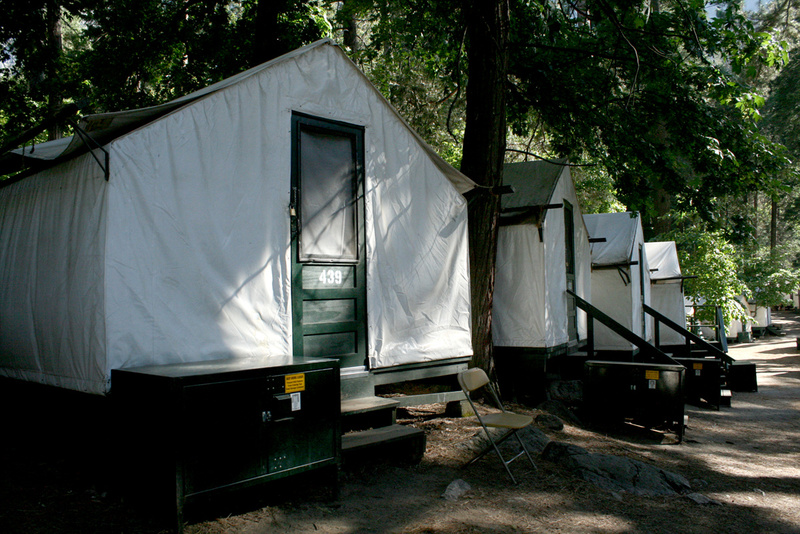 We spent our night there and tomorrow morning we were going to leave to Yosemite! We finally got to Yosemite and it looked like we were going to live in a forest. I forgot what the entrance said, but through the entrance you would pay. Then we saw Tunnel View which was a very long tunnel and stopped. The mountains were very high and beautiful. We drove another long time until we stopped at Curry Village. That is where our tent was going to be. It looked like a mini house a with water-proof outside made with fabric. You can also see a Bear Box that you store your food in. If you don't, you will attract bears and they will lift up the flap and look through the window to see if there are any foods that humans eat. If you are holding it, they will ignore you and go away because they do not like humans. We left Curry Village and stopped at Visitor Center that was like a museum. It had very interesting things like a rock that was once part of Half Dome and facts about John Muir, a preservation of wilderness in the United States. There was also a gift shop and I bought a pin that represented Half Dome. Then we took the shuttle to the trail to the Yosemite Falls. There are two falls, the upper and the lower. We climbed the lower because the upper is much too hard for us. My mom, dad, and I climbed together and my brother climbed himself. He ended up with us too. We together climbed all the way to the top, and when we went back down, my brother and I played in clean but cold water. It was very clean and cold because it was water that used to be snow! I accidentally fell in the water and it was very cold, but it was worth it. The third monument we went to is Mirror Lake. We could see a side of Half Dome, reflected down on Mirror Lake. I tried sculpting Half Dome with sand and water, and I discovered that it took more than thirty minutes! Finally, all of us walked to the shuttle stop and took a ride to Curry Village. There, my dad ordered pizza and ate a happy meal. Then we walked back to our tent and rested. Today was a extremely pleasant day and that was only the first day! Today was the second day and I was ready for another exhausting day! 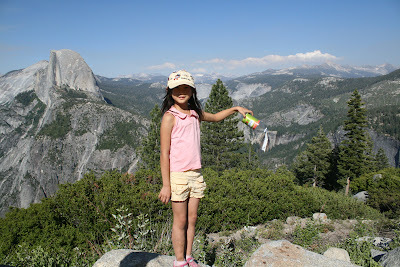 We were going to Glacier Point! There were two choices, you could drive, or walk. If you walk, it will take you about four and a half hours. If you drive, it you will be in the car for about one hour. We chose to walk and first I have to tell you that all of us were really burned out! The walk was 4.6 miles up and 4.6 miles down too! From the bottom of Glacier Point all the way to the top, the height is 3,200 feet. There were not a lot of people there on that trail probably because most people took the easy way. Driving! When we were going to the top, we ran out of water! An amazing view of Half Dome from Glacier Point! Taking a closer look of Half Dome with binoculars. After all of those relaxing events, my mom, my dad, my brother, and I all walked down the mountain. It was easier than going up, but you had to control your feet from sliding. This time, we did not run out of water but no one wanted water! When we finally got to the bottom of the mountain, it was already dark, but good thing that we had flashlights and our phones could give off light too. It was so dark that we got lost at one point, but then we saw the shuttle going towards something that looked like a shuttle stop. We rushed to the stop, but we weren't fast enough so we waited about twenty more minutes for the next shuttle to come. Today was the third day and we were ready to pack up and leave Yosemite! Different from the Yosemite falls, this fall is wider. Now I was at the top and it was a beautiful looking down at the fall and the people looked like ants! The water behind this tree is the water from Nevada Falls. That is a fall that is above Vernal Falls. The water comes down from the Nevada Falls and goes to the Vernal Falls. Next time we were going to go to the Nevada Falls. Now we were going to leave Yosemite and now we were going to Napa Valley, the world famous wine growing region and were stopping at the Jelly Belly factory first! I said one last goodbye to Yosemite and wondered when we were going there again. Hopefully, we will go to Yosemite soon! Have you ever been to Yosemite? If you had, what trails did you go on? If you haven't, are you interested to going? What a fantastic post! I absolutely love Yosemite National Park. Not only is it a beautiful place, but it also brings back many good memories for me. 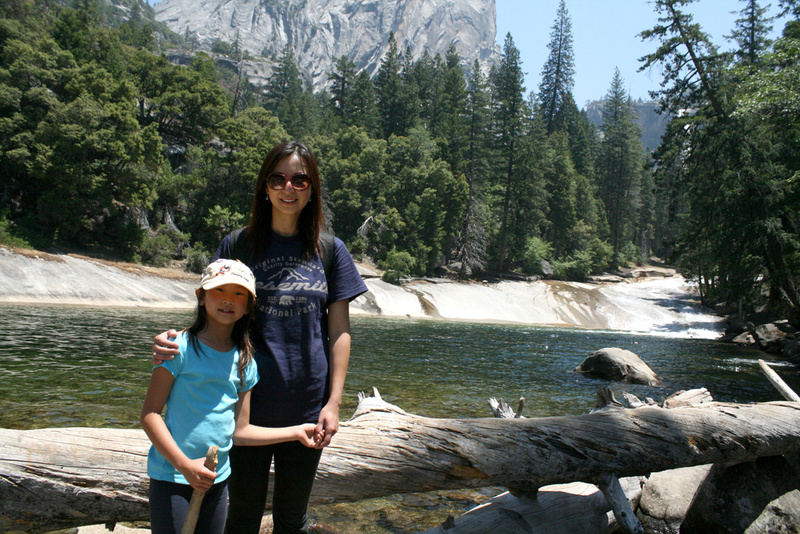 Growing up, my parents would take me to Yosemite every summer. 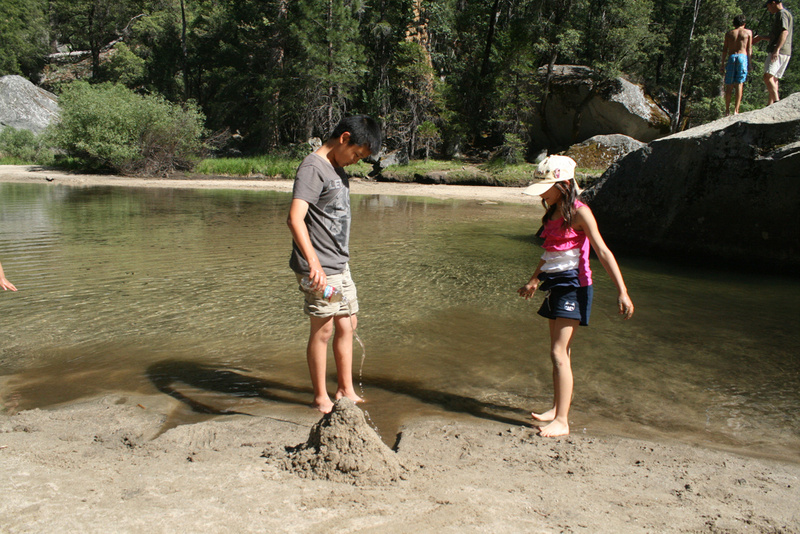 We did many of the same activities that you did, hiking, camping, and swimming in the river. I have not gone back since I was a little girl, but my parents will now take Miriam and Sarah (my kids) there this summer. Unfortunately I will miss out on this trip as I have to work. Hopefully one day I will go back too. We did do lots of hiking, but we did not swim in the water. My brother and I did wade in the water of the Yosemite Falls, and my brother was lucky that he did not accidentally fall into the water. I was a little lucky that it was a hot day. It was like yesterday where we live which is about ninety degrees to one hundred degrees! That is only about from noon to 6:00. My family and I definitely camped too! Unfortunately you will miss out on the trip, but fortunately you can take some days off of work and come back any time you want. You can also go with Miriam and Sarah too. I wish I could go to Yosemite. The things that I have that relates to Yosemite is a t-shirt,a book about Yosemite, and animal cards. My parents brought that back from Yosemite when they went and hiked the lower part of Half Dome. Back to the subject. It looked like you had a lot of fun at Yosemite. 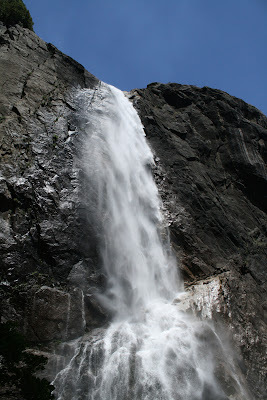 From your pictures that you posted I think that I would love to go to Vernal Falls because it looks very interesting. If you walked along the Misty Trail you really would be sprayed with mist? The next place I would like to go where you went would be Glacier Point. 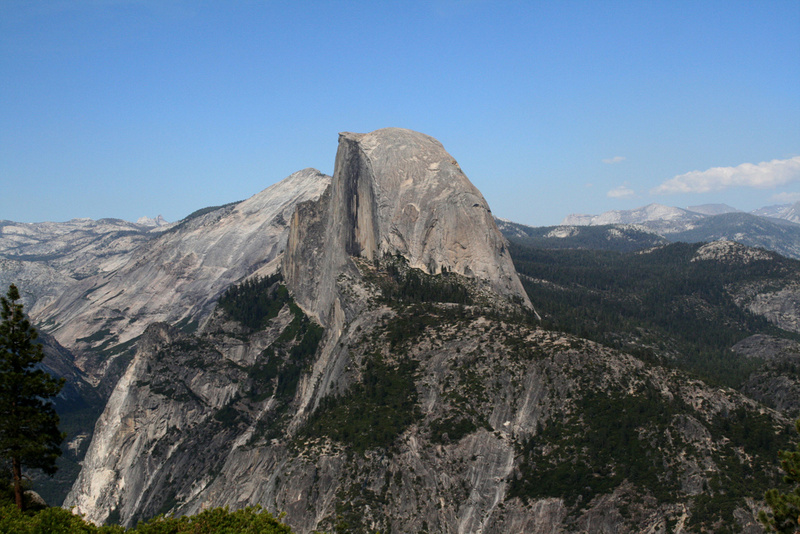 Why did the people who founded it name it Glacier Point? Anyway, it seems like you had loads of fun at Yosemite. The Mist trail also leads to Half Dome. 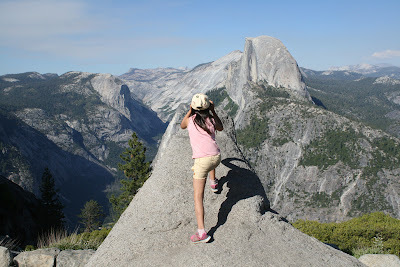 There is lots of risks when you climb Half Dome. I did not climb Half Dome. 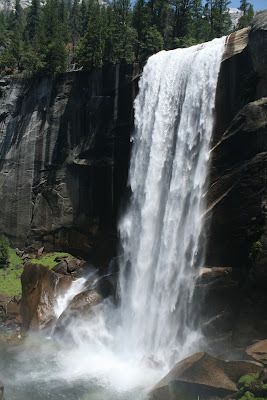 If you came close to Vernal Falls, you would really be sprayed with mist. That is because the water splashes and sprays you. We went on a hot day so we were lucky to have a little mist. Do you like to hike a lot? Glacier Point is called Glacier Point because it is a good place to watch stars at night. Have you ever gone to any National Parks? If so, can you list them?